Welcome to Beyond Taekwondo! 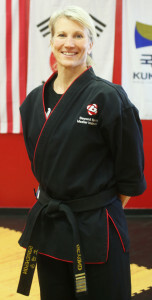 Whether you are new to the martial arts or have been studying for years, Beyond Taekwondo will feel like home! Prior to opening this studio in 2002, I worked with children for 15 years, as both a teacher and in social services. While both of those professions were fulfilling, I came to a point where I realized I wanted to reach kids early—before they had to make hard, life-determining decisions—and give them the tools they need in order to be successful making those decisions. These skills range from the ability to communicate clearly, to having the self-confidence to stand against the crowd. I did not start Taekwondo until late in life, but when I did, I realized it was the perfect medium for teaching these skills. If it could boost my confidence as a grown woman, what would it do for youth and teens struggling with creating their identity? Or, for that matter, other adults whose lives could be enriched by this knowledge? So, while the children love to do Taekwondo because they can kick and yell, we know it is much more than that. We do Taekwondo because we are learning life skills along the way that will help individuals grow into confident, responsible people who will be our leaders in years to come. People need a strong moral base to manage their minds and hearts along with their bodies. If you teach them to kick and punch with no guidelines, you’ll end up with a bunch of bullies. On the other hand, if you teach them correct principles and how to control their minds, bodies, and spirits, you will have well-rounded leaders whom others will want to emulate. Following are the traditional tenets of Taekwondo that we believe are the foundation of a well-rounded individual: Courtesy, Integrity, Perseverance, Self Control, & Indomitable Spirit. We have incorporated these into our Student Creed, which is recited at the beginning of each class. After each tenet the students state the definition and then the powerful “I” statements that show how that tenet is to be be applied in their lives. Being respectful and considerate of others. I always show respect for myself, my family, and my community. Doing what is right even when no one is watching. I choose what is right over what is fun, fast, or easy. I pick myself up each time I fall. I can do hard things. I only use what I learn to protect, defend, and keep my environment safe. Always believing in myself. I can do anything I set my mind to. I am a positive example for everyone around me. I go Beyond my limitations and by doing so, lead the way for others to follow. Beyond Taekwondo: What’s in a Name? When Beyond Taekwondo was originally founded in 2002 it was under the name of Competitive Taekwondo Club, or CTC. Over time, however, we realized that this name and logo did not represent our full vision, so we changed our name to Beyond Taekwondo, with the red swirls. Beyond: Surpassing boundaries, becoming more than expected. Taekwondo: At our heart we are Olympic Style Taekwondo, with all of its tradition and history. Red Swirls: Continual growth & learning. We never want to stagnate, so we are constantly working on improving ourselves to reach that next level, in all areas of life. To give as many people as possible the knowledge, skills, and confidence they need to be their best selves. Self Esteem is a cycle that comes from completing goals, seeing that we can be successful, and undertaking new goals. Making a commitment gives you a reason to continue when times get tough, and they always get tough if you are challenging yourself enough to grow. 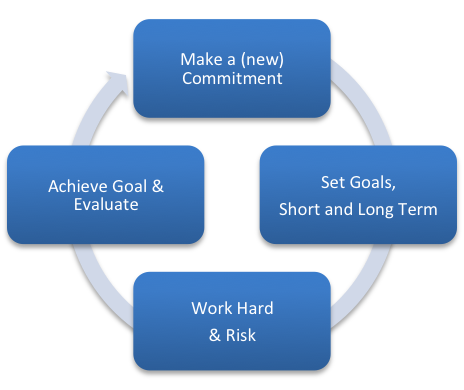 Setting and tracking goals allows you to see your progress, and by achieving interim goals you gain the confidence to tackle the harder goals still to come. Hard work & risk go hand in hand. Risk is going beyond what you know, pushing the envelope to see if you can succeed. It is by pushing (working) that we grow mentally (self knowledge), physically (muscle), & spiritually (the ability to push harder next time). When you keep your commitment you then have proof within yourself that you can do it again. Sometimes it is necessary to adjust and re-evaluate goals, but we do not believe you have failed as long as you have pushed and worked and given 100%. That is what actually builds confidence—giving it your all and making it to the finish line. To continue building, it is important to evaluate your progress, learn from your experience, and initiate the cycle once again. Our testing system is in harmony with this cycle. 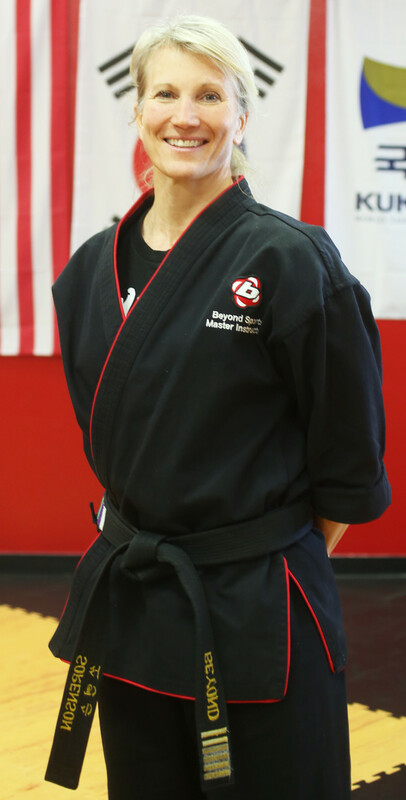 Each students starts at White Belt and works their way up through the ranks, setting new goals, working, risking, and testing until they reach their ultimate goal—Black Belt. We see the biggest jump in confidence and self esteem when they reach this goal, and it is one of the reasons we do what we do.